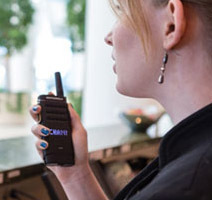 The SL300 radio is one of the newest members of the MOTOROLA family, its sleek look and lightweight design is exactly what many of our hospitality and warehouse workers have been asking for. Measuring less than an inch thick, the SL300 redefines portability. It can be carried easily in a pocket or purse without catching or bulging. It is IP54 rated, which means that the end user can be guaranteed rugged and reliable radios. It is splash proof & dustproof for use in harsh environments. The size and performance of the radio is remarkable.